For those students that do not already have appropriate health insurance, Georgia Tech is proud to offer Student Blue, underwritten by BlueCross BlueShield of GeorgiaTM. This plan includes comprehensive covered benefits (medical, dental and vision) that meet the federal Patient Protection and Affordable Care Act (PPACA) mandates at the 80/20 coverage Gold Level. Please Note: the coverage is for 1 academic year only and all eligible students MUST enroll each fall for coverage continuation from policy year to policy year. Mandatory students are charged on tuition by the GT Bursar’s Office for the mandatory student health insurance. Mandatory students need to enroll online with Student Blue Ins. Dependents must be added when student enrolls online with Student Blue Ins. The student premium will be charged on tuition and the dependent(s) premium is to be paid directly to Student Blue Ins when enrolling. For those who request a waiver and then want to purchase insurance, the student will elect online to cancel the existing waiver (during the waiver/enrollment period); once that is done the student will be able enroll for the academic policy year on the Student Blue website. This plan is not subject to the BOR insurance requirement, taking at least 4 credit hours, OPT, Affiliate Postdoctoral Scholars, and J1 Scholars. The student or eligible participant must enroll for the academic policy year on the StudentBlue website. Dependents must be added when student enrolls online with Student Blue Ins. The student premium and the dependent(s) premium is to be paid directly to Student Blue Ins when enrolling. Students (and dependents if applicable) pay for Fall then receive an email notice for Spring/Summer coverage. Students do have the option to cancel the Spring/Summer coverage during the Spring/Summer open enrollment/waiver period. Mandatory students: the student must enroll themselves and dependents under the Mandatory Plan. All dependent premiums are paid directly to Student Blue and the student charge will be assessed on tuition by the GT Bursar’s Office. To continue enrollment for Spring/Summer, Student Blue will email a premium notice in late Fall. Voluntary students: the student and dependents must enroll under the Voluntary Plan. The Fall premium is paid at the time of enrollment. To continue enrollment for Spring/Summer, Student Blue will email a premium notice in late Fall. If the premium is not paid, then coverage will be terminated at the end of the Fall semester. Note: If the student is not eligible for the Spring/Summer semester, then your dependent coverage will terminate as well. Affiliate Postdoctoral Scholars work through the office of Grad Ed & Fac Development. J1 Scholars and OPT work through the Office of International Education. If you are in one of these groups, then to enroll you must contact Student Blue for appropriate application. Voluntary premium paid direct to Student Blue via monthly bank draft. The student must enroll for the academic policy year on the Student Blue website. The Fall premium is paid at the time of enrollment. To continue enrollment for Spring/Summer, Student Blue will mail a premium notice in late Fall. If the premium is not paid, then coverage will be terminated at the end of the Fall semester. What is the difference in the “Health Fee” and “Student Health Insurance”? The health fee is a mandatory fee charged on tuition for all students taking 4 or more credit hours per semester (fall, spring, summer). 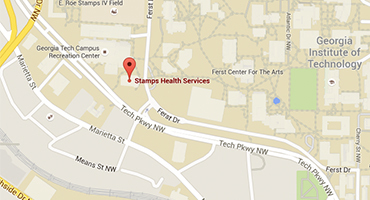 The health fee covers most services at Stamps Health Services and is not health insurance. The Student Health Insurance Plan, available for GT students, provides medical, vision, dental, prescription, and worldwide coverage. What is the difference in “mandatory” and “voluntary” student health insurance? The Georgia Board of Regents designates certain groups of students who must enroll in Student Health Insurance. These groups are enrolled in "mandatory" student health insurance. Students taking 4+ credit hours on campus and do not fall into these groups may elect to enroll in "voluntary" student health insurance. All undergraduate and graduate students enrolled in programs that require proof of health insurance as determined by the USG Institution. Currently Georgia Tech only requires Mandatory Health Insurance for graduate students in the CHBE and BMED programs and APPH majors. I am automatically enrolled in mandatory student health insurance, but I already have private insurance. Can I waive these fee? The waiver process can take up to 10 days. Once waived, a notification will be sent to GT Bursar's Office from Student Blue Insurance to remove the charge from your Bursar account. The mandatory student health insurance charge is automatically added to tuition and if the submitted waiver is approved and have paid the insurance fee, the GT Bursar's Office will refund the fee. Can I add my spouse and/or child(ren) to my student health insurance plan? Yes, Student Blue Insurance allows students to add a spouse and child(ren) to their policy. When can I enroll myself and/or my spouse/child(ren) to my student health insurance plan? There are 2 open enrollment periods per policy year – Fall and Spring/Summer (see dates above). Mandatory students must go to the Student Blue Insurance website and enroll to add dependents, they are not automatically added. Both mandatory and voluntary student health insurance enrollees must renew their dependents' coverage each fall. If the student status changes from mandatory to voluntary between semesters, the student will not be charged on tuition and must enroll (and add dependents, if applicable) under voluntary if eligible. There are 2 open enrollment periods per policy year – Fall and Spring/Summer (see dates above). All students who are in the mandatory group should enroll online to expedite the enrollment process. Voluntary students and all dependents must enroll online in the SHIP to receive coverage. For more information and to enroll, please go to the StudentBlue website. Please note: If you miss the open enrollment period, you will not be able to enroll until the next enrollment period. If I am a co-op/intern am I eligible to enroll in student health insurance? If the student is in the Georgia Board of Regents mandatory group then the student will be charged on tuition for mandatory insurance. If the student is not in the mandatory group but is taking 4 or more credit hours then the student is eligible for the voluntary plan. Can I use my private health insurance at Stamps Health Services? At this time only the Stamps Health Services Pharmacy files insurance claims for prescriptions. Stamps Health Services does not file insurance claims for medical services rendered other than to the GT Student Health Ins Co. Also, Stamps Health Services is not on any managed care contracts except for the GT BCBS Student Blue POS plan. Students that do not have the GT Student Health Insurance and incur charges (most services are covered through the student fee) pay at time of service and we provide a statement that students can file to their insurance carrier. I think I am in the mandatory group but I was not charged on tuition – what do I do? I filed a waiver and my waiver was approved, but the charge is still on my tuition – what do I do?